The Mrieħel high-rise developers have presented evidence that a promised €50,000 contribution to a new artistic fund was in fact carried out as promised. Tumas Gasan holdings provided Times of Malta with a receipt for the €50,000 payment dated November 25, 2016. 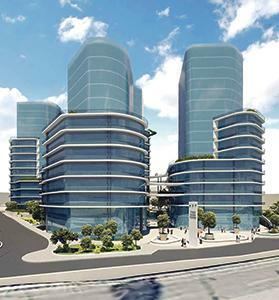 An artist’s impression of the Mrieħel high-rise project. The Sunday Times of Malta reported that the contribution – relating to a controversial permit for four towers of 14 to 19 storeys each in Mrieħel – had not been made in 2016 as promised, and would only be imposed now that the developers have applied for an extension to the project. This was based on the case officer’s report for the new application, which states: “the contribution was not imposed in [the original permit] since it was approved prior to its introduction”. The report goes on to recommend that the €50,000 contribution be imposed in the new permit, since it was mandated in the first instance. It is not clear why the report, published earlier this month, makes this statement if the payment was made two years ago. Questions sent to the Office of the Prime Minister, which stepped in to offer assurances in 2016 that the contribution had been imposed, remain unanswered. The artistic fund, announced in September 2015, requires developers to make a contribution of between €25,000 and €100,000 for permits issued under the Floor Area Ratio (FAR) policy, which governs high-rise projects. The fund is intended to support cultural infrastructure and spaces. The proposed extension to the Gasan and Tumas group’s €70 million project will increase the floor-space of one of the towers by around 1,200 square metres, keeping the same building height, as well as adding an underground car park, supermarket and other commercial uses. The extension itself is largely uncontroversial, as the additional construction will be hidden behind the already-approved East Tower. However, photomontages submitted by the developers reignited concerns over the overall visual impact, as the artist’s impressions appeared radically different to those produced by the same consultants for the original development. From key viewpoints in Mdina and Valletta – a major part of environmentalists’ objections and the failed appeal – the towers appeared far closer and more prominent than they originally did. The difference was due to changes in the PA’s guidelines for photomontages implemented after the main project was approved, but raised questions over whether the public had been given a mistaken impression of the four towers’ visual impact during the application process. The case officer has recommended that the project be approved against a €230,000 planning gain – apart from the artistic fund contribution – to fund environmental and urban improvement projects in the locality.